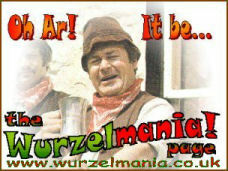 The first ever single issued by Adge Cutler & The Wurzels, and the birth of recorded Scrumpy & Western music. 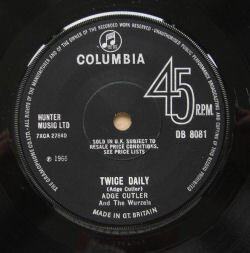 The two sides of the single were taken from the recording session at the Royal Oak in Adge's home town of Nailsea in Somerset, from which the first LP Adge Cutler & The Wurzels was released. 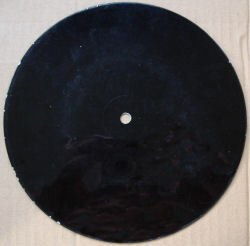 The cuts on the single are the same as those on the LP. 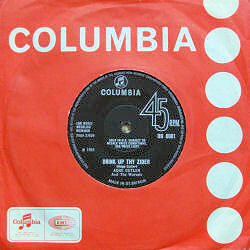 As well as being the first single by Adge and the Wurzels, this was their most successful in chart terms, reaching the UK national Top 50 and peaking at #45 - this was not surpassed until The Wurzels topped the charts in 1976, by which time Adge had sadly died. 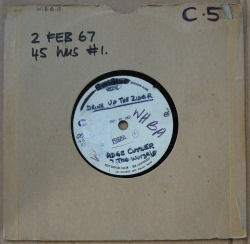 Both sides of this debut single remain arguably the most popular songs written and sung by Adge - they are both still sung as part of The Wurzels' regular act, and have been performed by many other artists over the years. It's probably no exaggeration to say that Drink Up Thy Zider has passed into the folk tradition, and has become a sort of "national anthem of North Somerset" (as Adge himself said). A month after Adge's death, Columbia re-issued the single (Columbia DB9031). 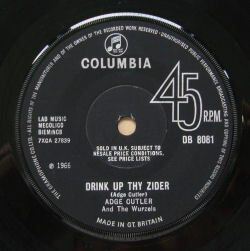 The timing of Drink Up Thy Zider is given on the label of the demo copy as 3 min 10 sec, as can be seen below. No timing was given on the b-side. The labels of the regular issue copies are pictured top right; and the labels of the demo version of the release are pictured below. 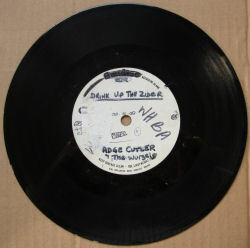 The photo on the bottom right is of the acetate of Drink Up Thy Zider. Pctures of the actual acetate (front and back) are shown at the bottom of the page.